Projekttitel: Science without frontiers? Political context of circulation of knowledge between the Byzantine Empire and the Muslim world in 750-1100 C.E. The topic of the dissertation project is “Science without frontiers? Political context of circulation of knowledge between the Byzantine Empire and the Muslim world in 750-1100 C.E.” Although more and more interdisciplinary research is being done on medieval intercultural intellectual exchanges, little attention has been paid to their social and political contexts. 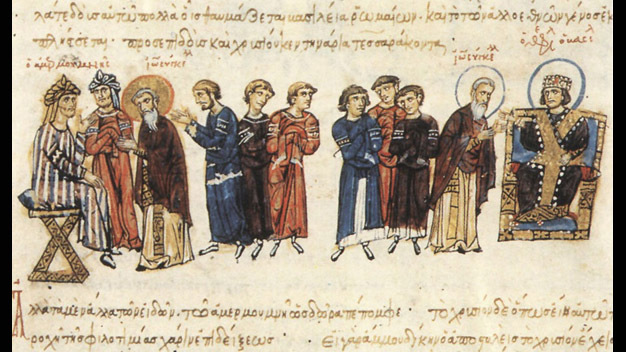 Particularly little research of this kind has been done on Arabo-Byzantine intellectual relations, despite that Greek and Arabic sources often present intellectual developments in the Byzantine and Islamic worlds as happening in connection with each other. So the civilizational prestige of the Byzantine Empire casted a long shadow on the minds of the elites of Baghdad during the 8th to 10th, when they embarked on the famous translation movement, which resulted in dissemination of Greek philosophy, medicine, mathematics and astronomy into Arabo-Muslim thought. The Abbasid caliphs, their courtiers and scholars are alternately portrayed in the Arabic sources as either impressed by Byzantine science or as trying to minimise their own intellectual links with the empire of Constantinople, the infidel adversary of the Muslim umma. As it comes to Byzantines, they wrote much more rarely and succinctly about the impact of the Arabo-Muslim culture on themselves. They were, especially in the beginning of their contacts with the Arabs, rather “exporters” than “importers” of science. Accordingly, the Byzantine sources comment on the legitimacy of sharing ancient “Roman” knowledge with the infidel foreigners, as in the story about Leo the Mathematician, a great scholar allegedly exhorted by the caliph to leave Constantinople in order to offer his talents at the Muslim court and prevented from doing so by the Byzantine emperor himself. At the later stage, when some Arabic medical, astronomical and even literary works were translated into Greek by the Byzantines, the prologues to these translations often give us the motivations behind importing “exotic” knowledge from the infidel enemies. Not only politics played a role in science, but also science had a place in politics. Both Arabic and Byzantine authors presented the diplomatic encounters as events with strong cultural (and sometimes intellectual) dimensions. In their narratives, they depicted a kind of rivalry of prestige, employing spectacles of richness and demonstrations of intellectual superiority in order to embezzle foreign ambassadors or courtiers. These perspectives can be seen initially only in the Arabic sources, but gradually even the Byzantines, usually treating all the foreigners as coarse barbarians, seem to have picked up the gauntlet and entered the logic of cultural rivalry. Some of them (Nicholas Mystikos, Michael Psellos) even acknowledged the civilizational parity of the Arabs. I hope that my research will clarify the reasons of this change. Information useful for such work is dispersed among various sources. I plan to use various types of materials, especially: Arabic and Byzantine chronicles; Arabic historians of science and “traditional” historiographers; information accompanying translations (colophons, dedications, introductions); mirrors of princes inciting the image of the ruler as patron of arts and sciences and finally, religious texts stigmatising the issue of foreign knowledge. Byzantinische Botschaft im Jahr 829 am Hof des abbasidischen Kalifs al-Ma'mun. Detail aus der Madrider Bilderhandschrift des Skylitzes. 12.-13. (Cod. Vitr. 26-2, Madrid National Libary über Wikimedia Commons).